Hello everyone, welcome to our Thankful Thursday Blog Hop, you all should know the drill by now and you also know that we are always happy to see you! Every Thursday we post about things we are thankful for and we’re sure ready to do that once again today. We really enjoy reading about all of the things you are thankful for too and we sure love it when we see new blogger pals hopping in to join us! It’s been quite cold here in the South and even though this nice towel stole one of my ears, I’m still enjoying the heck out of it. You know most of us kitties enjoy helping with the laundry, right? Well, even if you’re one that doesn’t enjoy helping with the laundry, that’s okay too, we’re all a bit different. One of the many things I’m thankful for is nice warm and fresh towels. We get those on the ottoman and on the green bench, and let me tell you, when the fresh towels go down the comfy cozy appears. Oh, one other thing I’m thankful for is the soft and plush blankies on the big bed in the big bedroom. I don’t know where the Mom gets them but talk about soft! Oh, they’re idea for Snuggle Season, or for any old season. Those plush blankies can sure get the happy feet going too. Blankets aren’t just for Winter, the Mom keeps some of the plush ones on the big bed for us regardless of the season. So, what are you thankful for today? 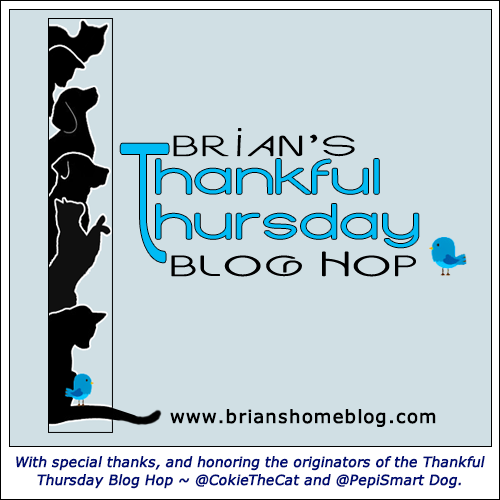 Tell us in the comments and then join us for The Thankful Thursday Blog Hop. Remember, adopt cats, we deserve it!!!!! More Forever Homes More Often! Purrrrr! Zip! Later! Oh yeah, Brian! Nothing better than fresh towels. Happy snoozing and snuggling! I’m thankful for all the fun things I get to do with my life! I got to do a photo session today, and I’ve got a cat show in San Diego this weekend. Good times! I am super thankful for the warms from my new heaty-pad! And I love fresh towels and soft blankies too. Have a wonderful day, my furiends! We also appreciate cozy blankies and warm mats too. It is cold outside but warm indoors thanks to our furnace that blows warm air. WE are really thankful for that! Brian, dear furiend, I also enjoy fluffy towels and nice soft blankets, too. Alas, due to my love of water, I’m not allowed around the wash-machine (the staff fears I’ll get myself locked in the washer) …. For that matter, Katsu isn’t allowed to help with the laundry, either because he sort of has an addiction for socks – and instead of help match them, he sort of got caught filling our cat-house with them…. Warm towels and plush blankies in winter make us humans happy too, Brian. Aah, a nap on a pile of warm laundry, that’s the best. Even our grand-boy calls his freshly laundered blanket his “bundle of joy”! Laser loves nothing more than me in a towel fresh out of the shower. She spends hours rolling on my lap and rubbing against me and insisting I fuss her. Warm laundry is the best and electric blankets and heating pads. We are thankful for all those things too. 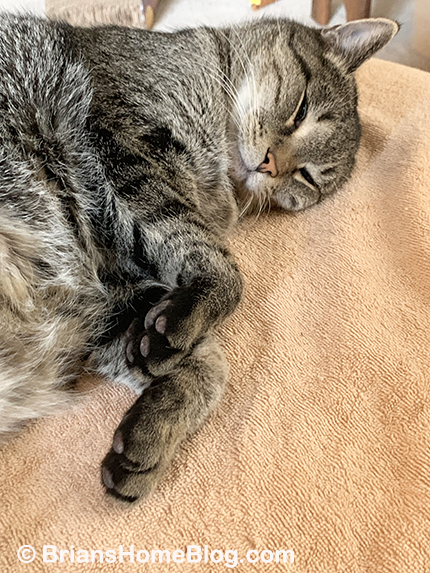 I do help Mom change sheets on the beds even though she doesn’t consider it very helpful but my favorite part of that is when she also changes towels – today’s the day and I already have a nice fresh one on the BIG BED which I’m about to curl up on top of! YAY for Thankful snoozes – and thanks for having the Hop too Brian! We are thankful that the rain is going to stop today! Oh Brian, you do look so comfy on those great towels. Nothing better than a nice fresh soft towel. You all have a good day and hope you are all staying dry. Our kitties never hop into the fresh laundry basket even when stuff is warm. They do like to snuggle and be warm in other ways, though. Oh, I’m VERY thankful for cozy blankets! We have several polar fleece blankets to help keep us snuggly warm at night and then I have a nice fleece lap blanket I can toss over my legs & feet when it’s especially chilly. I don’t do cold weather very well, never have and the age thing makes it even harder. Getting old stinks royally! I never understood as a kid why my grandparents’ house was hotter than you know where but now I totally get it. Enjoy those comfy, cozy towels and keep warm! Being warm and cozy in the winter is extra special and it’s good your peeps know about fresh towels and blankets to make cozy even better. Oh what a treat to beat your feets on the S.C. Plush! Plush blankies are the best! It’s very cold here in middle Missouri. Temps will be in the single digits at night so those plush blankies are good for super snuggles! Stay warm…spring is coming! Our pups love warm towels fresh out of the dryer too! I’m so glad that you kitties get to enjoy them too. Your parents are the best! Ahhhhhhhhhhhh what a sweet photo. Mom’s have a knack for knowing just how to make their furries purr with delight. Yours is a keeper. Happiness is a freshly laundered fluffy towel, we’re with you Brian! It’s raining here today, so cozying up on warm towels and soft blankies sounds pretty good to us!! Best feeling in the world a fluffy warm towel. A real gift. We are thankful for warmer temps and rain. It is helping to melt the ice, so the puppies will have easier walks. Even us woofies agree, nothing like a fresh warm towel or cozy blankie on a chilly day! Nice and warm and fluffy sure works for us! We are thankful for when the blankets come out of the dryer and put on the bed right away. They feel so good on a cold winter night. You love your comfy towel so much in that photo. Thanks for the share. Have a wonderful Thankful Thursday. Right now i am thankful for pecans and my heating pad and that work is over for the day. Fresh towels right out of the dryer are the best! Ooh warm towels and blankies are definitely something to be thankful for! Oh, we’re with you, Brian! We enjoy fresh towels and the (mom’s) plush blankie too! There is nothing like a warm blanket on a cold day. Towels are popular with Olive and Woodrow here, too! I love warm towels and freshly dried wash. I prefer those soft jersey sheets TW has to her quilts and conforters which she also keeps on the bed all year cos the ac is cold. Oh, warm and toasty towels are the best! The mom over here recently bought a new fleece blanket, When she cleaned it, she took it straight out of the dryer and put it on the couch, and in a matter of seconds over half the kitties in the house were claiming a spot on it. Warm wishes to all of you! Oh Brian, we know all ’bout those plush blankys. We luv ’em. Fankfully, Mommy keeps one as a topper year ’round. Emjoy your comfy nap. Big hugs fur all.